Don't let your kill switch fail, if it does your out of the race! 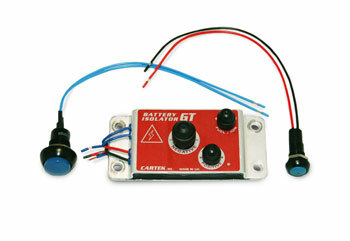 The Cartek Solid-State Battery Isolator kit is a leap forward in design and convenience. This isolator contains no moving parts and offers superior resistance to shock, vibration, moisture, and dirt. Utilizing MOSFETs, the Cartek isolators provide safe and spark free isolation of the vehicles battery and engine electronics. The GT model (450A *Shown) is appropriate for all uses except premium motorsports where the XS Model (600A) is recommended. From Wedge Kyes of Baton Rouge, Louisiana on 5/16/2012 .